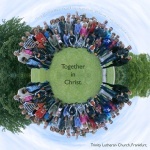 Trinity Lutheran Church is an independent, international English-speaking congregation located in Frankfurt, Germany. Church members, associate members, and friends come from a wide range of denominational backgrounds. Trinity has been blessed with an exceptional children's ministry, a remarkable music program, and a thriving community very interested in Christian life activities. We are a community dedicated to making disciples as Jesus instructs his disciples in Matthew 28:19-20. Our church has an affiliation with The Lutheran Church—Missouri Synod (LCMS) and receives its pastoral leadership from the LCMS. Our worship services are held each Sunday at 11 am in the sanctuary, Nibelungenallee 54, 60318 Frankfurt. Take a look at the area map and public transport directions here. Please have a look at this page if you would like to get in touch with us. Trinity’s roots stem from the need to provide spiritual care for U.S. military personnel and consulate workers following World War II. 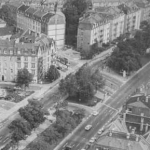 In 1956 a group of American Lutherans living in the Rhine-Main area asked the German church, die Dreieinigkeits Gemeinde (in English, Trinity Congregation) located near the Frankfurt Zoo, to begin regular Lutheran ministry in English. The first service for a handful of worshipers was held at the church a year later. The name Trinity Lutheran Church was selected to honor the then host congregation for their assistance. Trinity is governed by a church council elected annually from congregation volunteers. Besides the governing officers, the council is made up of elected deacons ministering to programs in Christian Life, Youth and Education, Worship and Music, Inreach, Outreach, Stewardship, Property, and Communications.